Roag cottage is a 100 year old croft house, luxuriously refurbished to allow you a comfortable holiday in the midst of the Site of Special Scientific Interest of the Howmore River Lagoon. The internal woodwork was made by craftsman Donald MacDonald of Hacleit, Benbecula. Much of the crockery was made by potter Miranda Forest of Bornish. There is original artwork by Grace Beaton, Miranda Forrest, Donald Ferguson , Bill Neill, Gerard McKernan., and Francis McKernan, Peter Deeny and Richard Waugh. There are four bedrooms, one double, one with two bunks, one single, and one with a futon. There is an upstairs sitting room where you may enjoy views of Hecla, listen to music , watch a DVD, or simply relax. The kitchen is modern with a kerosene burning Rayburn providing cooking, hot water and central heating. The bathroom has an integral bath and shower. There is one fiddle, one guitar, and no television or landline. O2 signal and digital radio are received in Roag. 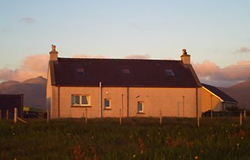 In Roag, you may enjoy the comfort of the cottage which is very warm and cosy. You may enjoy all the area offers, with white shell sand five minutes down the road, machair walks with birds and flowers aplenty, hillwalking on the three peaks of South Uist, cycling for miles through the quite machair roads of the Middle District townships, and swimming in the clear Atlantic water. It can be cold! Wildlife includes a rich diversity of flowers on the bog, machair, and mountain; birds including a huge variety of waders, corncrake, raptors including golden eagle, sea eagle, buzzard, and hen harrier, divers and ducks, white swans and mute swans; otters, deer, shrews, mice and rats and much more.